Live in the city long enough and you may cease to notice its core: a collective living and working environment for as many people as possible. I stayed up till early morning watching the Argentine senate debate and subsequent vote on the agricultural retenciones. Since I generally stay awake till 3am anyway and I’ve always been a news junkie, not falling asleep wasn’t difficult. Besides, it certainly was dramatic, finishing at 4:30am. The VP Cobos, who had to cast the deciding vote in a tie-breaker, definitely looked like he wanted to be anyplace but in that position. It’s not often that a Vice President votes against his President, so the political fallout should be interesting to watch over the next few days. Of course, Argentina is a constitutional republic and not a parliamentary republic, so Cristina has several more years left as president. Next year’s mid-term elections should be fascinating. Despite Argentina’s checkered history of insurrections in the last century, the great thing about republics is that – over time – they survive political divides and unpopular presidents. During this year’s political crisis in Argentina I tried to stay away from blogging about politics, and work demands kept me away from Tuesday’s massive demonstrations. Somehow, though, a part of me does wish that hundreds of thousands of people would gather in support of improved education, health care, or fighting prejudice and discrimination. (But that doesn’t happen in my own country either, though Obama is turning out good crowds). Ultimately, politics does so much come down to economics. …..I had gone into the small grocery in my neighborhood…you know, one of those Chinese-managed supermercados all over Buenos Aires. I brought my bread, eggs, salchichas, & Coke up to the counter. The cashier, rather than being Chinese, was Cristina Fernández de Kirchner….she rang up the prices on the register, which all seemed much more expensive than my last visit to the market, and passed the items on down the counter to the bag boy, who turned out to be Néstor Kirchner….but as he sacked my groceries, Néstor kept breaking the eggs……..I’ll let that image sit with you for a moment……………for those readers who don’t know… eggs, huevos, in Spanish has a double meaning. That’s a true dream, seriously…..though I guess now it’s Cobos who is doing some egg breaking. So, if I’m dreaming about this, then what do Argentines dream? Browsing around the stalls at the mercado de San Telmo reveals some enchanting relics buried amidst an exhausting range of junk. On Saturday we came away with a set of old music scores, partituras. Not unexpectedly in Buenos Aires, much of the sheet music is tango though an occasional opera score is intermixed with the tango. Never having learned to play any instruments, we’re more interested in the cover art rather than the actual sheet music. Some of the graphic design is really very good. The archivist in me wants to hope that somewhere there is a collection preserving all this stuff. These images didn’t come out very good since the sheet music covers are too large for our scanner, so these are just a few poorly done snapshots. Depending upon the vendor, you might pay 25 pesos and up for one of these scores from the 1920s. But if you search around some of the junkier booths, you can find some for only 5 pesos. The typography is outstanding. I’m sure these can be found at a lot of places around Buenos Aires and not just the mercado de San Telmo. That’s just the closes place to where I live. So, if you’re stuck for ideas about a unique gift or memento of your trip to Buenos Aires, then consider old tango sheet music….suitable for framing. I’m really trying to post more often, after being mostly absent from this blog last month. But today, I’ve not even gotten out of the house. So I decided to scan through the tons of photos that I’ve been intending to post about…. Early last month while walking down Azcuenaga street next to Recoleta Cemetery I saw another building demolition almost completed. Particularly, I was intrigued by that window on the very back wall. I was half surprised that the demolition crew had enough sense not knock it out completely. I’ve not been back by that block in a few weeks, so I guess it’s completely gone now, salvaged and sold off. I don’t have a very good zoom on my little camera, so this is the best close-up I could get of the window. As I often do when I encounter these demolished buildings, I started wondering about the building that was there before. Obviously, from the looks of this window it appears that the previous house must have been quite nice at one time, right? 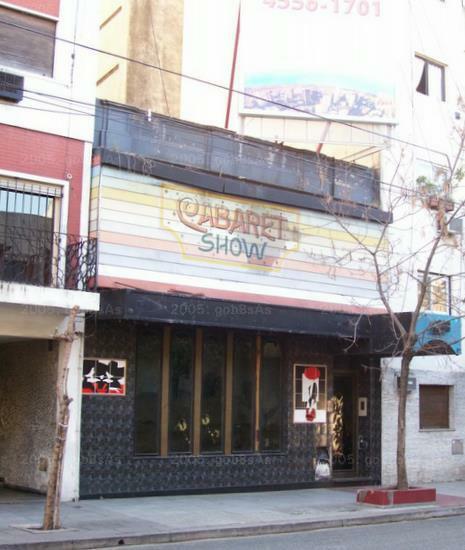 Cabaret show?…I really had to examine the photo closely to make sure that it was the same lot of land, but yep that appears to be the same place…..well, that strip of Azcuenaga is filled with clubs of a dubious nature. I always tell people that you never know what is behind the facade of buildings in Buenos Aires. And this is a case where one certainly never knew what was behind the walls of the cabaret show. The other day I received in the mail a review copy of The Authentic Bars, Cafes, and Restaurants of Buenos Aires by Gabriela Kogan. There is a serious lack of English-language travel books about Buenos Aires other than the traditional guidebook. Kogan, a graphic designer in Buenos Aires with her own local imprint, provides a nice addition, a good supplement to, say, The Rough Guide to Buenos Aires. The pocket-sized format of The Authentic Bars, Cafés, & Restaurants of Buenos Aires makes it an easy volume to carry around in your exploration of Buenos Aires. It certainly could be useful in pre-trip planning as a way of narrowing down some places that you want to try out. But to try all the places you basically have to live here. I’m not a foodie and this book isn’t much on reviewing the quality of the food at these places. That type of review is best left to Dan of Casa SaltShaker or by consulting the Oleo guide to restaurants in Buenos Aires. (Also related to this topic, Dan has an extensive, bilingual English – Spanish Food & Wine Dictionary ). What The Authentic Bars, Cafés, & Restaurants of Buenos Aires does provide you with is the sense of a place, a feel for the individual spots. Undoubtedly, one of the great pleasures in visiting Buenos Aires is sitting in one of the city’s classic cafés. For my first reading of this book, I decided that there was no better place than at one of my own neighborhood cafés, so I headed over to El Hipopótamo (photo below), which oddly isn’t listed in the book though fortunately the other fine place just across the street, Bar Británico is covered. Visiting these places and writing these brief descriptions, I realized that I began to retell and relive what Buenos Aires is really like, its history in all its idiosyncrasy….writing this guide has connected me to the joy of what is genuine, of what doesn’t need language to translate. It has connected me to the essence of Buenos Aires. There are a number of my favorite places in the book and quite a few that I didn’t know about. Some of the places are those deservedly mentioned in all the guidebooks, but then there are the other little, local places that are full of character. I often advise visitors to Buenos Aires just to walk randomly around town and drop in on any corner café. But for those people who like a little more structure, some guidance, then this book can help you uncover the charm of Buenos Aires. Yanqui Mike also has a review of this book on his blog.